How are women represented in senior-level leadership at Christian colleges and universities? In short: there has been progress, but there’s still plenty of room for growth. Prompted by this question, a team of researchers, headed by Janel Curry, provost at Gordon College (Wenham, Massachusetts) and Amy Reynolds, associate professor of sociology at Wheaton College (Wheaton, Illinois), utilized financial support from the Imago Dei Fund to create the Women in Leadership National Study. This study examined more than 1,400 nonprofit institutions in the U.S. (including CCCU institutions) to assess the status of women in leadership and learn from organizations that have been successful in advancing women. This article will pull out and examine the data specifically tied to the institutions of the CCCU to assess the current representation of women in leadership and offer insights from five institutions that have higher levels of effectiveness for moving women into leadership. In looking at institutional data that U.S.-based CCCU institutions submitted in their federal form 990 in 2010, the study found that only 5 percent had female presidents. By contrast, the overall number of female leaders at colleges and universities in the U.S. that year was 26 percent. The results were similarly disheartening at the provost level. In 2010, only 19 percent of chief academic officers at CCCU institutions were women, whereas 40 percent of all U.S. colleges and universities had female provosts. Similarly, only 19 percent of CCCU institutions’ board members were female, compared to 28 percent nationally. Recent research shows this gender gap in senior leadership at CCCU institutions has improved some, but the rate of progress remains slow. As of 2015, women held less than 30 percent of positional leadership roles in any category, and barely more than 20 percent of all senior-level positions. Women accounted for 6.7 percent of college presidents and 29 percent of chief academic officers. The area of greatest growth in the representation of women at CCCU institutions is at the board of trustees level. In 2010, 48 percent of CCCU institutions were overseen by a board of trustees whose composition was at least 20 percent female, while an additional 14 percent had board compositions that were at least 30 percent female. By 2015, these numbers rose to 55 percent and 19 percent, respectively. When the Women in Leadership National Study conducted its research, the most recent official data at the time was from 2015. But how much has changed in the last three years? According to the data the CCCU gathers each year from its members, the number of female leaders continues to rise slowly but steadily. Women now account for 7.6 percent of presidents in the U.S. (up from 6.7 percent). Numbers are going up on a global scale as well. Out of the CCCU’s 183 current members, 16 are led by women. The Women in Leadership National Study did not stop at benchmarking the current state of gender diversity in the CCCU. Instead, its ultimate goal was to identify some of the best practices that could be implemented at the institutional level for promoting, advancing, and retaining women in senior-level positions of leadership. 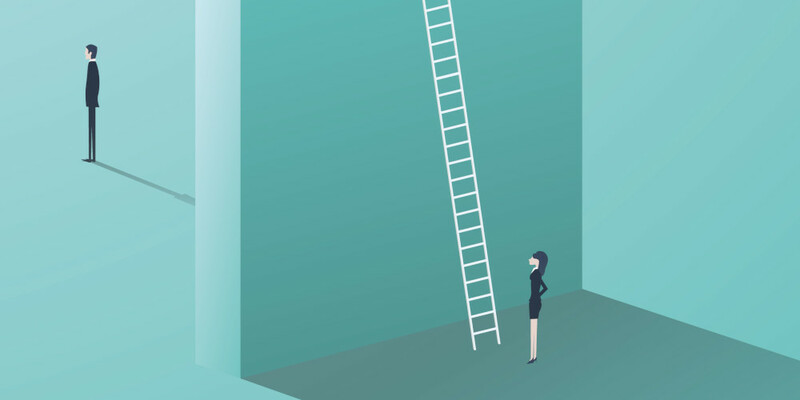 Building off of the previous data, researchers surveyed and interviewed leaders at five CCCU institutions with higher levels of effectiveness for moving women into leadership. In comparison to many previous studies, this one involved both men and women and focused on institutional effectiveness. One survey highlight is the fact that women reached the highest level of leadership within traditions that emphasize the Holy Spirit, such as Pentecostal, Holiness, Wesleyan, and Anabaptist. Beyond that finding, the survey allowed researchers to draw out even greater distinctions about views of women in leadership in society, the church, and the family. The study found that 94 percent of the leaders affirmed that women and men should equally serve in leadership positions within society, but there were greater differences of opinion between men and women in regard to gender roles in the spheres of church and family. Of note is the fact that few institutions surveyed had clearly stated positions on women in leadership. This, combined with the fact that both men and women leaders sometimes attend churches espousing views that may or may not conform to their own perspectives, left women trying to guess at where their peers were in supporting them in their roles. What distinguished those institutions that were using women’s gifts most effectively? These organizations had developed a professional ethos and also practiced flexibility in how and when they drew on an individual’s gifts. These organizations demonstrated intentionality in advancing women, stemming from the senior-most leaders. Senior leaders were visible and vocal in their support of women in leadership. This involved identifying ways in which women could use their gifts in leadership positions and encouraging them to step into the calling that the Holy Spirit had given them. These institutions also encouraged discussion about barriers to and experiences of women. This allowed women to be comfortable in sharing their experiences. These institutions were focused on mission and vision, wanting God’s gifting to be fully utilized for the sake of the Gospel. The leadership in these institutions could articulate why gender diversity mattered in accomplishing the institution’s mission. Ultimately, the study revealed intentionality and leadership, with a focus on mission, to be central tenets to institutional change around women in leadership. Given this information, Gordon College (with financial support from the Sister Fund) hosted a workshop in October 2017 to convene a group of teams to develop such intentionality in their own institutions. These teams came from Biola University, George Fox University, Gordon College, University of Northwestern – St. Paul, and Wheaton College. Each team of men and women – sent at the behest of their respective presidents – was required to include at least one vice president; other team members included students, deans, staff, and faculty. Utilizing insights from the study, as well as research from their own campuses, each team developed individual campus strategies for change and proposed measures to monitor change on their campuses. The event also created opportunity for cross-institutional sharing, where individuals holding similar campus roles met together to exchange experiences and strategies. Each institution’s plan attempted to address its leadership’s current goals and to focus on strategies that would bring about the greatest change in developing female leaders. The range of strategies clearly showed the importance of building change in multiple areas but within the context of the particular college or university. Below is a look at some of the common themes that emerged from the created plans. At George Fox University, the team developed a yearlong “Advancing Women in Leadership” initiative as part of its goal to engage and promote female campus leaders, including department/division leaders and executive leaders. Participants first met for a retreat to spend time together, and will continue to meet monthly for the next year in both large and small groups to facilitate learning and discussion. Similarly, the team at the University of Northwestern – St. Paul is creating a group for the continuation of supporting female professionals within the institution. Initiatives from this network will include mentoring programs, leadership development programs, speakers, and focus groups. The steering team will study current research, conduct institutional assessments, and utilize data to direct these actions. Plans are in place to purchase a software license developed specifically for setting up a structure and process for mentoring relationships. 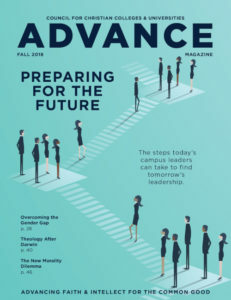 Several institutions are creating plans for engaging students – both female and male – in the discussions around the value of women in leadership, as well as offering mentoring for female students. University of Northwestern – St. Paul, for example, is launching a student club this year that will equip female students with leadership skills and encourage them to live out God’s plan for their lives by connecting them with female campus leaders and alumni for mentoring. Other institutions are utilizing campus programming to connect with students. Biola University is developing a one-day event for the entire campus community that will utilize the expertise of several scholars to help men and women consider different ways they can partner together to support women in leadership. Likewise, Gordon College had two of its cabinet-level leaders (one woman, one man) lead a training session and discussion with the student leaders who will be on campus for the 2018-19 year. Additionally, the theme for this year’s convocation series there centers around the idea “That All May Have Life Abundantly: Making Spaces for Human Flourishing”; all the speakers of the series will be women who lead in a variety of areas on campus. In addition to mentorship and discussions, institutions are also analyzing ways their institutional practices can promote greater engagement and support of women leaders. George Fox University updated its gender climate audit earlier this year; leaders there are currently analyzing the results and will present on the findings – including identifying targeted areas for improvement – to campus employees later this fall. Biola University’s leadership team has developed three goals that will guide its work for the next year: 1) continue to improve gender diversity in senior leadership and maximize the value of the diverse teams that are being developed; 2) increase awareness and advocacy related to gender climate within the current senior leadership; and 3) ensure equitable hiring and human resources practices for faculty and staff. The ultimate goal is to help leaders understand the challenges that women face and the barriers that may exist to their promotion and thriving, and to then make decisions and establish practices that address those issues. Similarly, the team at the University of Northwestern – St. Paul is putting the final touches on the university’s Diversity Strategic Plan. This emphasizes directives that foster a campus environment promoting a welcoming, Christ-centered community that understands, respects, encourages, and celebrates the richness of diversity, as well as reflects a commitment to increasing the diversity of students, faculty, staff, administrators, and board of trustees through the intentional recruitment, retention, and representation of ethnic minorities. Once the plan is completed and approved by the institution’s board of trustees, it will provide the context for an ongoing conversation at the senior leadership level and allow for institutional accountability for these goals. Most of these initiatives are in their early stages. So why talk about them now? Each of the teams involved in developing plans for their institutions hopes their institution can become a learning community and share with others what they learn on their journey. They recognize that intentionality, ownership by leadership, and connection with their individual institutional missions are central to their success, but they also know the value of learning from others’ examples. Thus, the purpose of sharing this information now is two-fold. Our hope is that these examples help you consider your own campus community’s needs and how you might be able to promote, support, and develop the women leaders at your institution. We also hope that this will inspire other institutions to share their own stories of similar efforts they’ve developed in their own campus context. Together, we can reverse the trends of under-representing women at senior leadership levels and help our leaders – and by extension our campuses – fulfill their God-given callings. Janel Curry is the provost at Gordon College (Wenham, Mass.) and is one of the founders of the Women in Leadership National Study. Kathryn Willeman is a recent graduate of Gordon College and served as a presidential fellow there during the 2017-2018 academic year.